The Great Detectives of Old Time Radio – Page 737 – The great ones are back in action. Click here to download, click here to add this podcast to your Itunes, click here to subscribe to this podcast on Zune, click here to subscribe to this feed using any other feed reader. Vote for this show on Podcast Alley. Dan Holiday answers a letter in Box 13 in response to an ad he placed seeking adventure. Holiday gets more than he bargained for. 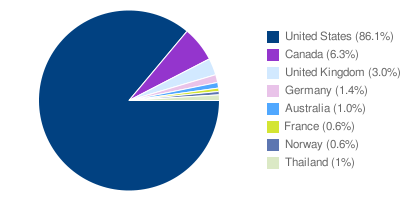 So of our first 500 unique downloads, 86.1% from the U.S. and a total of 92.4% come from North America when Canada is added and 96.4% from English speaking countries when we add the downloads from Britain and Australia. A tip of the cap to our German friends for generating the most downloads from a non-English speaking country. One thing is inaccurate about the pie graph. The 1% for Thailand actually includes downloads for 3 countries: Two unique downloads each for Thailand and Morocco and one unique download from Italy. Other interesting facts: even though the majority of the audience (52.3%) is using Windows, a substantial portion of you (43.7%) are using a Mac. Which isn’t a surprise given how popular Itunes is as a source of downloads with 80.6% of all downloads coming from Itunes and with another 5% going to I-phones, I’ll have to say a hearty thank you to the Apple Corporation. It should be noted that 7.4% of downloads are going to a Zune player. However you’re listening and from whatever part of the world, thank you. And if you’ve not yet signed up to subscribed to this series featuring some of radio’s greatest detectives, I invite you to do so. How Would You Like Your Detectives Boiled? 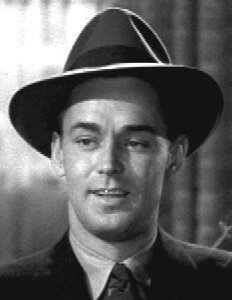 The phrase, “Hard Boiled Detective” is well-known to include private eyes like Sam Spade and Philip Marlowe. These tough hombres don’t shy away from a fight, have a downbeat outlook on life, and operate in a gritty, seamy side of the world. They’re known for the fast fists, and fast mouths. Johnny Dollar (coming this Friday) is from the hard boiled school, and so is Pat Novak (coming this Tuesday). One might say Novak is overboiled, but I digress. I’ve found out though that there are so-called soft boiled detectives, who are viewed as being more intellectual in solving their cases, not needing to get tough because of their keen reasoning skills. Sherlock Holmes (Thursday) fits into the latter category. But what about Dan Holiday in Box 13 (coming Monday), or Let George Do It (coming Wednesday.) How do they figure? It depends on who you ask. OTRCat swears Dan Holiday is a hardboiled detective, but that doesn’t seem to fit Holiday’s overall character. He can be sarcastic, but also goes multiple episodes without using his fists and doesn’t pack heat. No one’s even willing to place a marker on where George Valentine falls on the spectrum as he usually uses his mind, but isn’t afraid of using his fists. Detectives we’ll meet in future series have created even greater confusion. OTRCat claims that both Barrie Craig and Richard Diamond are hard boiled all the way. However, in a poll of Thrilling Detective readers, Richard Diamond finished as the second in a poll for most soft-boiled detective because he sang. Of course, those who have met with Diamonds fists sing a quite different tune. Barrie Craig actually made fun of hard boiled detective novels. He is openly philisophical and even at times philanthropic, and generally the type of guy you’d like to have over for dinner. Of course, if you cross him, he can take you down with style. And the soft boiled category has its problems, too. A broad category that puts geniuses like Sherlock Holmes and Nero Wolfe in the same class as the somewhat clever Mr. and Mrs. North and that lovable single father detective The Big Guy. Of course, most people will admit that some detectives won’t fit easily into either category, but will still try to jam detectives into a category that may not fit. My thought is that there are many unboiled detectives on radio. I think of Holiday, Valentine, and Craig as the type of person you might hire as the family detective (if people hired detectives like they do doctors and lawyers): Decent, honest, hard-working, and generally peaceful folks who could live next door, but who can be counted on in a pinch and when force is called for, will act decisively. 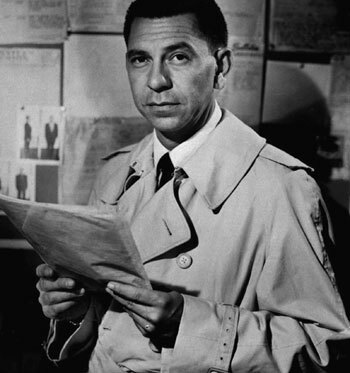 While I enjoy the outrageous hardboiled nature of Pat Novak and the mental methods of Holmes and Wolfe, the most real detectives to me are these unboiled detective because they have many counterparts in the real world. Look on your local police force and you’ll find more people like Dan Holiday and Barrie Craig than you will people like Sherlock Holmes or Sam Spade. Click here to add this podcast to your Itunes, click here to subscribe to this podcast on Zune, click here to subscribe to this feed using any other feed reader. Vote for this show on Podcast Alley.